Rabbi Yosef Carlebach’s grandson was born last year with a heart condition so serious doctors gave him little chance of surviving. However, after “many surgeries” that took him around the country and finally to the Children’s Specialized Hospital in New Brunswick, the boy, Mendel Avtzon, is expected to fully recover. Along the way to that recovery, Carlebach said, he was given the unexpected opportunity to perform mitzvot for others. The infant’s condition also gave the executive director of Rutgers Chabad the chance to meet and ultimately partner with the hospital’s president and CEO, Amy B. Mansue, to help others facing the serious illness of a child. At the 35th annual founders’ day dinner on Dec. 3 at Chabad House in New Brunswick, Mansue was honored for her role in funding a bikur holim room at Chabad House for parents of seriously ill children being treated at the hospital. The facility will serve as a refuge where they can sleep, take a shower, and eat kosher meals within walking distance of the hospital. CSH is affiliated with the Robert Wood Johnson Healthcare System, and the room will also be available to families of patients at Robert Wood Johnson University Hospital or other affiliated institutions. The already functioning suite of two connecting rooms has a private entrance, bathroom, coffee area, couches, and beds. A similar bikur holim suite was donated last year by St. Peter’s University Hospital in New Brunswick. “We’ve found that parents of sick children need a longer stay than those with other family members” in the hospital, Carlebach told `. Also honored at the dinner was former State Sen. Bill Baroni, deputy executive director of the Port Authority of New York and New Jersey. He was given the Ner Tamid Award on the seventh night of Hanukka for his role in ensuring the lighting of hanukkiot at Port Authority sites, including at its bridges and tunnels. Rabbi Mendy Carlebach of Chabad of North and South Brunswick said he and Baroni had lit a menora the previous night at 7 World Trade Center in lower Manhattan. 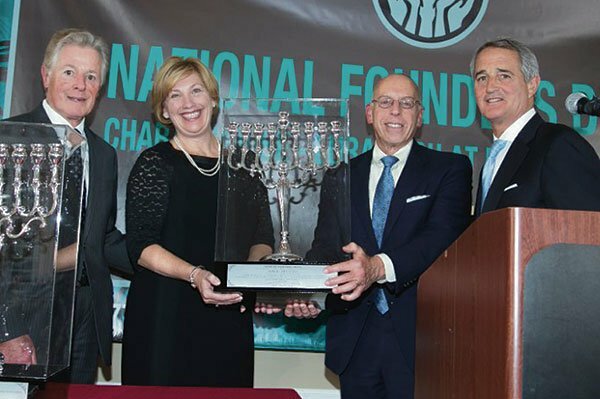 While the dinner raised about $700,000 toward the amount needed to complete the final phase — a Sephardi synagogue and international coffee house — of Rutgers Chabad’s $12 million expansion in New Brunswick, funds continued to come in over the next several days allowing it to reach the $1 million goal. 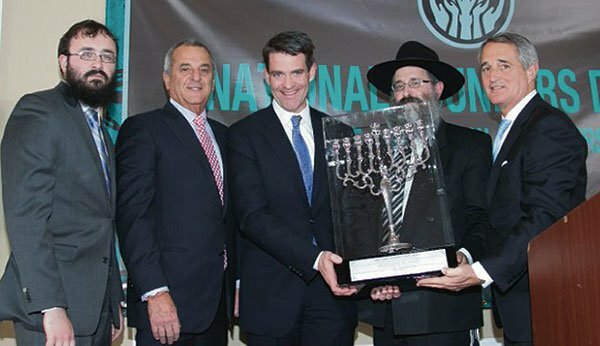 Children’s Specialized Hospital president and CEO Amy Mansue receives her award from Chabad with, from left, former Gov. Jim Florio and dinner cochairs Roger Fine and Jerold Zaro. Mendel Avtzon’s mother, Devorah Leah Avtzon of Brooklyn, told the crowd of 350 that her family refused to accept the boy’s diagnosis and found a doctor at Lucile Packard Children’s Hospital at Stanford University in California who successfully treated him. A nurse there introduced herself to Yosef Carlebach as a former Rutgers student from East Brunswick. That Friday night she lit Shabbat candles for the first time with him and his family. On Stanford’s recommendation, Mendel was transferred to the New Brunswick hospital. “For the first time in five months they humanized Mendel,” she said. The boy was hospitalized for nine of his first 13 months. Former NJ Gov. Jim Florio introduced Mansue, whose served as deputy commissioner of the state Department of Human Services while Florio was in office.